A recent study shows that truck driving is one of the top ten riskiest professions in the U.S. There are many risks involved when our truckers are out on the road for long hours every day including unfavorable weather to bad drivers on the road. Some days it would seem that the world is conspiring against them to prevent prompt deliveries. In addition, unusual schedules, lifting heavy items, fatigue, stress, sitting for long periods and an improper diet can all lead to server health issues. The average age of today’s truck driver is 49 - an age group with increased health risks. Years of continuous hauling and sitting can affect the circulatory system and high blood pressure can lead to a stroke or heart attack. A major concern is if this occurs during a trucker’s transit. Of course, the result could be fatal to both themselves and to the motoring public. wrist device is called HELO. The Helo LX is designed with active sensors which help to monitor blood pressure, heart rate, oxygen levels, fatigue, emotions and sleep quality, to mention a few. The Helo LX can perform an ECG/EKG and overall heart check. Additional features to be released Q42017 include blood alcohol levels, flu detection and an industry needed Non-Invasive Blood Glucose Monitoring for our diabetic drivers. This is great news for the American Trucker since the regulations involving diabetes is increasingly becoming a challenge for the driver in maintaining their CDL. The features of the Helo LX will be a great benefit to the health and safety of Americas roadways. 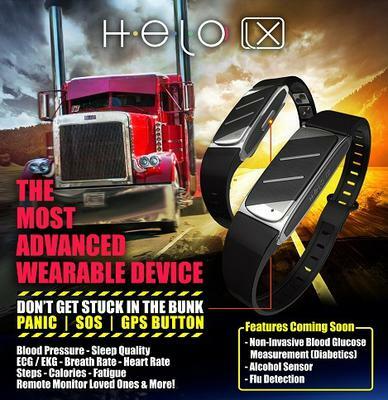 The Helo LX can help identify truckers who are developing poor health conditions before they become a danger to themselves and a threat to the safety of the motoring public. The Helo LX can monitor the driver’s health conditions, quickly spotting high blood pressure, diabetes or fatigue levels so that corrective measures can be taken immediately. Another amazing feature of the Helo LX is the remote monitoring. Imagine the peace of mind and reduced stress of knowing your loved ones are safe while being gone for days or weeks at a time. Our trucker’s families can enjoy that same peace of mind of knowing that their hard-working trucker is safe as well. Finally something I can get behind that helps the driver! Thanks for what you are doing for the industry. Wow! Nice perspective. I have high blood pressure and I travel quite a bit and I never check my BP because it’s such an inconvenience but I should be. Maybe a Helo is just what I need. I have a Helo it dose every thing they say. I am a retired truck driver and I wish I would have had a HELO when I was driving! "It is security." Very interesting information. I like that someone is looking out for the driver and his family! Thanks. Will be getting one of these!